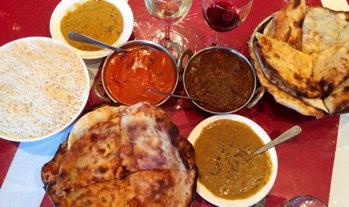 The plan to share dishes at Bollywood Dimensions works. 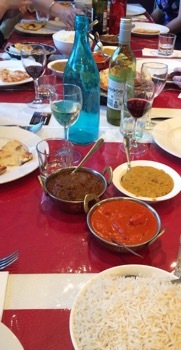 The two dals are full flavoured and rival the chicken and lamb dishes. Ordered in generous side sizes ($8.90) they add variety to the meal without increasing the price. The Kheema (lamb stuffed) Naan is better than the Paneer Naan and one serve of rice is plenty for two people. Do ask for mild spice level to cater for different tastes as even this is quite spicy. There’s a 25% Entertainment Book discount of the food and corkage ($5 per bottle) and more than one voucher can be used (although there’s certain conditions). 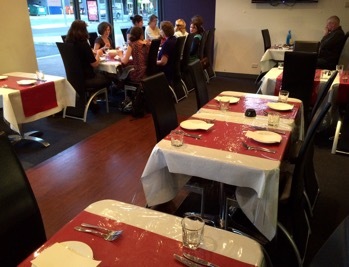 The restaurant is very flexible and is happy to work with the shared menu. While the decor is mid range when dining with a group the atmosphere can be quite festive. A recommended menu for groups of four people under $15 per person with the discount ($20 without) is…. 2 serves steamed basmati rice $3 per serve. 1 serve Awesome Butter Chicken (Mild) $18.50 Boneless Chicken pieces cooked in Tandoor and finished in a creamy butter and tomato sauce. A creamy and fairly mild dish. 1 serve Marvelous Lamb Pasanda – a chef’s special $18.90 lamb marinated overnight to ensure that the meat is tender and full of flavour. A rich, creamy dal preparation with lentils and red kidney beans cooked with an aromatic combination of spices.